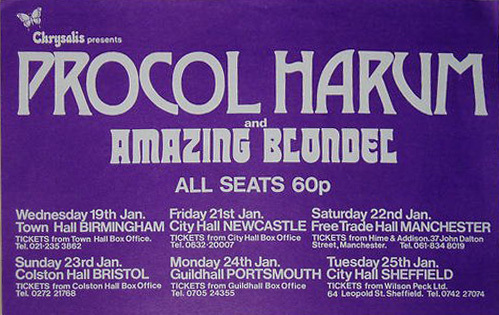 We have no authoritative master-source for these dates, so we rely on the fans to search their diaries, photo-albums, ticket collections, poster-stashes, even their memories: and send in further dates and references for any year of this growing Procol tour index. PA Hicks writes to BtP to say that this was his first-ever Procol Harum show: "I had just that day finished my first Teaching Practice – I was at teacher-training college in Weymouth, and was really looking forward to seeing them. It was a magnificent gig: they were supported by Supertramp and someone else who I can't remember. Dave Ball was on lead guitar. I particularly remember a blinding Whaling Stories. I was also shocked to hear the encore of AWSoP because a few days earlier I had read an interview with Gary Brooker who said he was fed up with it and wouldn't sing it again! As a result of the gig I immediately bought a copy of Home which I played incessantly! A great night – a mere 36 years ago!" Oklahoma Civic Center Music Hall. 720715 Virginia Beach (according to July 1972's Rolling Stone ... and this tallies with other evidence we have already collected). 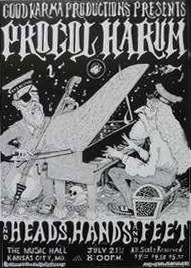 'Procol Harum headlined this show,' writes Jim Krapf. 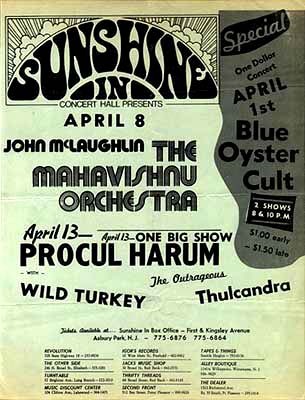 'Btw, this was at Kiel Auditorium and the place was 2/3 empty, and almost everyone left before the encore, so we few remaining true fans stormed down to the stage and Procol came out and played to what must have been less than a hundred people. In between encore songs, being only a few feet from Mr Brooker, I shouted Homburg and I remember Gary laughing and making eye contact with Alan Cartwright who also laughed recognition.It was as if to say, hey, there's some bloke here who knows Homburg! 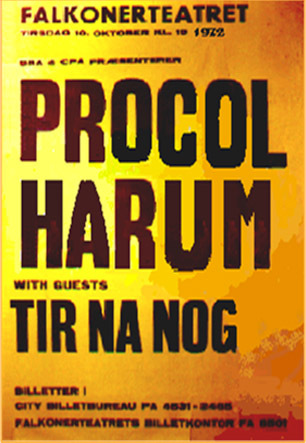 At their concert in St Louis the next year Procol played Homburg at encore'. Re: your request for specific recollections of late-1972 Procol dates, I have here the ticket stub from my first PH concert, which took place at the Aquarius Theatre in Boston on the fifth of November, 1972. The opening act was Steeleye Span, who played a lively set to generous applause. Some time later, the lights were all turned down, and one could barely make out the members of Procol Harum taking the darkened stage. We heard the sound of drums being tried out – no surprise, of course – but then that morphed into the opening drum figure for Bringing Home the Bacon (which none of us had ever heard before, of course). By accident or intent, the lighting person very effectively flickered the lights during those introductory measures, and only when Chris Copping played the famous organ line was the stage bathed in light: Nice! I remember also hearing Grand Hotel for the first time that night – Gary told us it was the title for their forthcoming new album – and Fires (Which Burnt Brightly), which Gary introduced by saying, 'Keith Reid describes this one as a campaign song.' (I didn't know what he meant by that, but I do remember thinking it was one of the most gorgeous pop songs I'd ever heard.) Gary introduced Mick Grabham (we were, of course, expecting Mr Ball), who broke at least two guitar strings during the set but played brilliantly well, and he made a brief reference to the famous date. ('Anyone here know what day it is? Gunpowder and treason, mates...!') I vaguely remember a music hall-type number that may or may not have been Souvenir of London, punctuated with lots of corny jokes by Messrs Brooker and Wilson, plus, I think, Long Tall Sally and Good Golly, Miss Molly as two of the three encore numbers, the third being precisely what one would hope for and expect. In other words, a magical evening with a transcendently original band! Thanks for prompting such a nice recollection – and of course enduring thanks for all that you continue to do for PH lovers the world 'round. Best wishes. 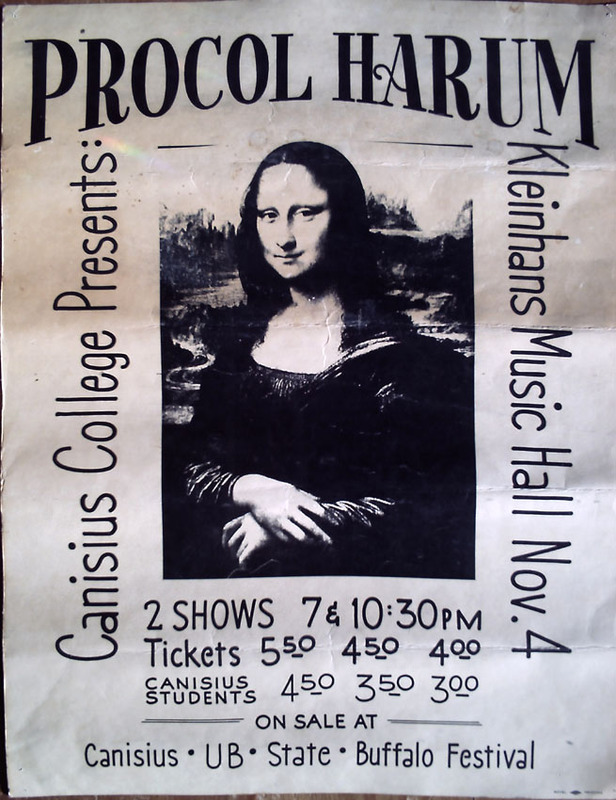 I've finally found my long lost poster promoting Procol Harum's 4 November 1972 concert in Buffalo, NY. I think it may be of interest to users of this great web site. I've been searching for it since I gave you the date (and you requested memorabilia) a few years ago. Eureka! As you can probably see, the poster has seen better days but it's not bad considering it's endured nearly forty years' storage in less than ideal conditions. Fortunately, it was printed on a very heavy cardboard stock and it will be well taken care of from this day forward. Measurements are 22" x 17" (55.5cm x 43cm). Obviously, there were two shows that night. Cheryl and I attended the 10:30 pm show. I'm still searching for the ticket stubs. Be assured, if I find them, I'll send scans. Marvin Chassman wrote to clarify, as follows: "I found this link at the omniscient Wikipedia. It shows Tir Na Nog at Queens College in 1972 (on 6 November, several weeks before Thanksgiving). In fact this late 1972 tour appears to be their only US tour. Assuming this info is correct (and it must be; I found it on the internet), the show in question is actually from 1972. 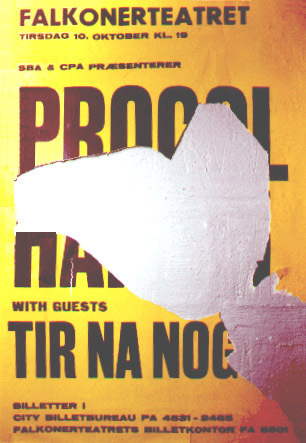 It's possible Procol played Queens College in '73 without Tir Na Nog but the tour list at BtP shows them in Europe at the time, so that's doubtful. Clicking the links in this Wikipedia schedule doesn't provide any details of the concerts, just the venues (for example, a picture of the movie theater where they played on 1 November). 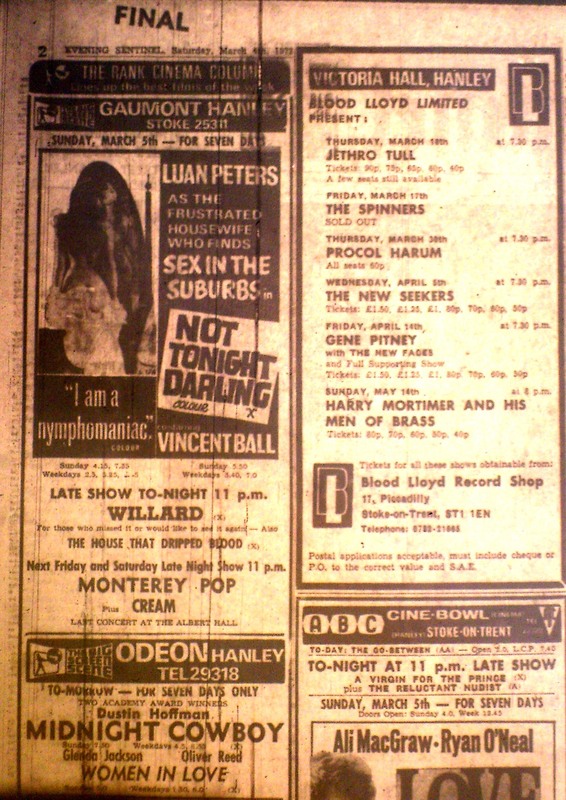 But assuming Tir Na Nog didn't play any solo gigs, you can add these dates to the PH list of dates for late '72." 72xxxx They played at the Kennedy Centre, in Washington DC on this tour. 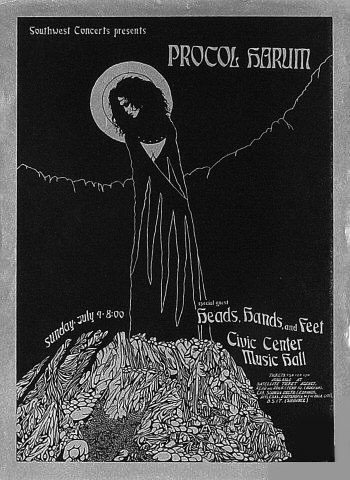 KenCen used to host occasional rock shows at the time. (I saw PH as well as ELO there, so maybe there had to be some "classical" connection, no matter how tenuous.) I was there, got in with a SRO ticket (standing room only.) Eagles' first national tour. I have no idea of the date, but it was 1972, my senior year of HS.